I know I've been writing a lot about hysterectomy stuff lately, so please hear me out on just one more post. It's such an emotional thing to go through, especially when you've waited all your life to have children as I have. One beautiful child that came exactly when he was supposed to. But then there have been no more. We've waited for five whole years. Part of that time I was too sick and on too many medications to even consider trying for more. The other part of that time was spent on an emotional roller-coaster of maybe we can have more, maybe we can't. I have often wondered why the Lord didn't step in somewhere along the way to prevent the disease of Endometriosis from ruining my organs. People say you shouldn't ask why in these situations, but that you should just accept that it is the Lord's will. Well, guess what? I ask why! I have plead with the Lord to understand this. I have to! I need to understand at least a little part of the reason to be able to find peace. Giving up the possibility of being able to bear more children is the hardest thing I have ever experienced. Days before the surgery I had a melt down and was asking God and my husband, How can you ask this of me? How am I going to give up that which is most precious and important to me in the whole world? How am I going to live with this choice? I thought I would die of a broken heart- and it felt like it too. People have also said that if you want to ask the Lord a question, pray. If you want to get an answer read the scriptures. In this case, they are right. That's what I've done. I read the Book of Mormon a lot. It always surprises me how no matter where I am reading in that book, the Lord will find a way to reach me through those words in just the right way. 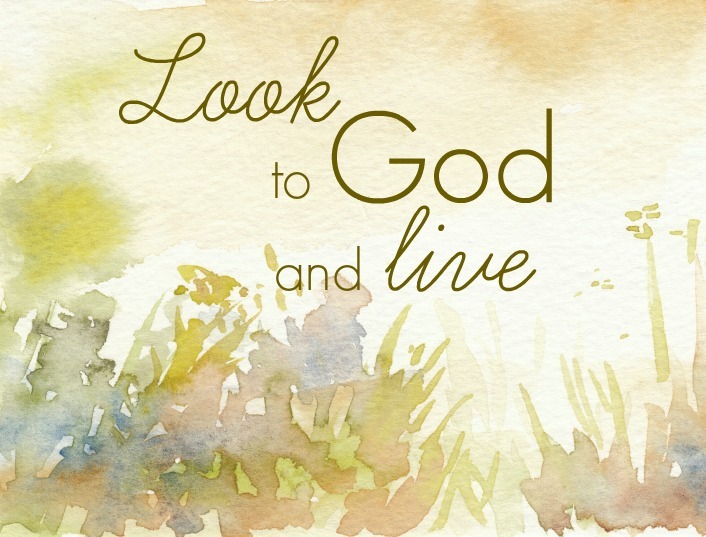 This week I discovered " Look to God and Live". Look to God, that's how I'm going to survive this. That's how I can live after losing my chances for more children of my own. So that's what I leave with you readers today. Look to God and live. There is no other way. My niece fostered two little brothers and has now adopted them. They are beautiful little children who are now being brought up in God's love. Their mother, pregnant with a third child a girl, decided she no longer wanted these two boys - they were a constant reminder to her of their father - a boyfriend whom she had since left. Beautiful boys - no longer wanted! Can you imagine??? Now they know they are loved and after some speech therapy they are doing so well...and are brought up in a Christian home with so very much love! Whatever you decide...with God in your life, you will have peace of mind - as long as YOU keep Him foremost in your life. I don't know what the Lord has in mind for us, but if we are to foster children I know I could be happy with that. We'll see! Thanks for sharing your niece's story with me! You have to look to God in all things then let God and let go. My problems disappeared once God took control. I was newly married - one year - when I had my hysterectomy. Knowing God was in control I watched to see what He would do.....He gave me a new life. It's not what I would have chosen but it is a very good life.....I don't look at what might've been but at what I have and thank God for it every day. BTW When I meet God face to face try not to be near me at the Gates as I have an awful lot of questions to ask and I will be a long time..... but until then I will thank Him and Praise Him. Thanks for sharing that with me Christine! I know I wouldn't have chosen my life to be this way either, but you are right, the Lord can make us into something new and give us new life if we let Him. And I think we will all have lots of questions for God when we see Him again. You won't be alone in that! I can't even imagine the pain you've felt. I'm so sorry you've had to go through this. How can you NOT ask why? You've done what is so hard to to. Sometimes we have to get out of our heads and hearts and just trust and surrender. I wish it was easier. Thank you for sharing your struggles. It helps others to know they aren't alone. Thanks for your encouraging words Jackie! It helps to share it. It kind of lessens the burden. Elise, I haven't read your blog for sometime and was very surprised hearing what you've had to go through. My heart is so broken for what you and your husband have had to go through, I am so sorry. I can relate a little in that I have one three year old daughter and have suffered infertility and hormonal issues for the past two years. I finally had pituitary surgery done in March in the hopes that I will be able to get pregnant now. I also got very, very sick from medication before the surgery and I'm still recovering both physically and emotionally from that, but I cannot imagine the struggle you have been through. But, we do serve a great and awesome God who does know exactly what He is doing even if we don't and that is why we can hope and encourage each other to just keep looking to Him our all in all! God bless. Madalyn, thanks for your kind words. I'm sorry for your suffering too. Thanks for the encouragement!